Along a canal towpath, butterflies flutter between cornflowers, creeping jenny and water forget-me-not. Blackberries slowly ripen as the last sprigs of cow parsley vie for space among the thistles. Birdsong radiates from young sycamore trees while a summer breeze stirs nearby fields of wheat. This quarter of a mile stretch of canal is a tranquil countryside haven for moorhens and swans. Then, a bund, or manmade embankment, is reached. Beyond it, there is no water. Instead, in the dry canal bed, a team of volunteers are working hard restoring the rest of the Wendover Arm Canal to its 18th century glory. Built in 1793, the approximately 7-mile long canal linked the market town of Wendover in Buckinghamshire to the Grand Union Canal at Bulbourne, Hertfordshire. It was originally designed to feed water to the Grand Union, first from springs near Wendover, then from purpose-built reservoirs. Although not initially intended to be navigable, the extra cost of making it wide enough for barges was negligible, so it was decided the work should be carried out. Tring Flour Mill used it to carry shipments of grain, and coal was transported to two small canalside gas works. Almost immediately after it opened, leakage along the Arm necessitated regular remedial work. The installation of new asphalt linings in 1857 proved unsuccessful. Spiralling maintenance costs and loss of revenue prompted its closure in 1904. The Arm, west of Tringford Pumping Station, was abandoned as a navigable waterway. A pipeline was laid beneath the canal’s bed to maintain the water supply to the Grand Union. Eight decades later, the canal was totally overgrown in places with grasses, weeds and nettles. Parts still had water but were unnavigable, resembling a stream rather than a canal. Then, in the 1980s, a group of local enthusiasts came together united by a passion to restore the canal to full navigation. In the autumn of 1987, with the agreement of the Inland Waterways Association, they formed the Wendover Arm Group, eventually to be the Wendover Canal Trust. “Initially, volunteers were largely scrub bashing,” says Nigel Williams. A former chartered surveyor, he is one of the early volunteers who joined in the 1990s and is now the group’s publicity officer. “We always worked outside the nesting period, and Berks, Bucks and Oxon Wildlife Trust were advised of our plans. Once cut down, trees and vegetation were burned on site. 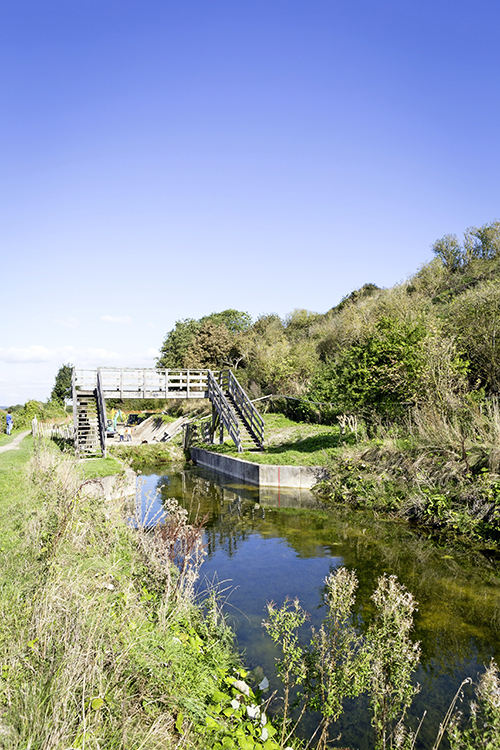 Restoration started at Little Tring’s stop lock, a low-rise lock at a canal junction where it joined the Grand Union. The junction was designed to prevent water from passing between canals. In spring 2005, water was pumped from Tringford Pumping Station to flood the newly restored section. It took almost two weeks and several million gallons of water for the section to reach the required 4ft (1.2m) water level. The rest of the Arm will be fed via an underground natural spring several miles away, where Coombe and Boddington Hills meet close to Wendover’s Parish Church of St Mary’s. Each stage of restoration begins with profiling, or preparing and restoring the sides of the canal. For the remaining sections to Drayton Beauchamp, concrete walls will be limited to sections under bridges and mooring bays. Instead, the sides are being constructed as natural banking to blend with the countryside. Once capping is complete, restoration work continues using mechanical excavators. The banks are excavated to a 45 degree angle to prevent bank slippage. Bentomat is extremely heavy and requires several volunteers to lay it. is a row of coir roll, a sustainable waste product from the husks of coconuts. This provides an interface between the concrete blocks and a layer of earth, placed over the remainder of the lining to a thickness of 1ft (30cm). This is built up to the top of the bank. Once the section is watered, only the natural bank is visible. Plant is hired from a local company, Morgans, who deliver and collect the machinery. The Trust provides hard hats, high visibility jackets and tools such as spades, shovels, spirit levels and theodolite lights to measure water levels. After the canal had been abandoned and dried, public footpaths were established crossing the bed. Once this stretch of canal is filled with water, the paths either side will be cut off. To link access from both sides, the volunteers have erected two new timber bridges. Each cost £10,000, largely funded by donations and sponsorship. Numerous plaques attached to the stanchions are dedicated to sponsors who helped fund construction. There are currently more than 50 volunteers. Groups work one week each month, with more than one million hours currently accumulated during the project. Fundraising is ongoing. One of the regular volunteers is 73-year-old Ray Orth, who has been involved with this project for more than two decades. As assistant restoration director, he plans the working parties. “I am a retired mechanical engineer, but have always had an interest in canals. I’ve also been boating for 40 years,” he says. “There are an average of eight people per working party, mainly men but some women, too. We start at 9am and finish at 5pm or 6pm, though earlier in the winter. “You have to think ahead all the time. Sometimes what you’re doing doesn’t make sense until you think of the bigger picture. Earth is put on the bank when digging out a trench, then it goes back on top of the pipe capping. We just spend our time moving earth around. It does get a bit worrying when you recognise bits of earth you shifted two months ago. Ray has gained a Plant Operator’s Licence qualification for driving diggers. He is now responsible for training volunteers before they are allowed to drive vehicles on site. Roger Bowes heard about the Trust through a volunteer he met at a party. He had recently retired as a programme manager with a computer firm. There may be many years to go before completion of this project, yet the commitment and enthusiasm of the volunteers never wanes. “The more we do, the more people realise that we’re serious and we will complete this job,” says Nigel. The order in which sections of the Wendover Arm Canal are being restored was devised by restoration director Roger Leishman. He is a retired British Rail civil engineer who lives in the nearby town of Berkhamsted. His plan divided the whole project from Little Tring to Wendover into three phases. Each has its own sub phases. Phase 1, from the stop lock to the winding hole, was completed at a cost of £400,000. It opened to navigation in the spring of 2005. The team are now working on phase 2, from Little Tring to Drayton Beauchamp. This phase has been divided into seven stages, each approximately 383 yards (350m) in length. Stages 1 and 2 are complete, 3 almost finished and 4 under way. This stretch of the work has so far cost £407,000, with a total estimated completion figure of £950,000. The cost includes the reconstruction of three bridges, plus work to a fourth. The volunteers are applying for a Heritage Lottery Fund grant. The third, long-term phase extends from Drayton Beauchamp. Here, shallow water currently meanders through villages towards the picturesque market town of Wendover four miles away. Here is the natural spring head that provides the water.